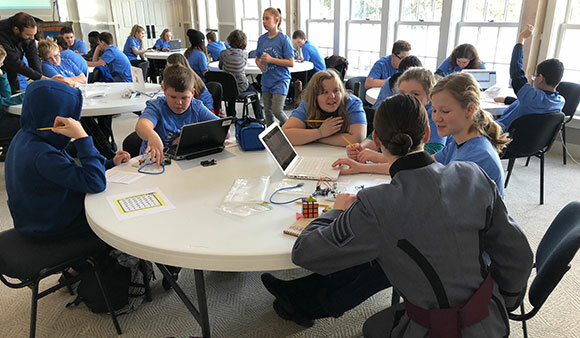 Students from across the Adirondacks worked side-by-side with cadets and professors from the U.S. Military Academy building circuit boards and learning about careers in STEM at the West Point Robotics Workshop on January 24-25 at the CFES Brilliant Pathways Conference Center. The unique partnership between CFES Brilliant Pathways and the United States Military Academy was started in 2013-14 and has exposed 1,500 CFES students to potential jobs in Science, Technology, Engineering and Math (STEM). Workshops are held around the country and focus on STEM activities such as programming robots to solve real-life problems and college and career readiness. Dr. Samuel Ivy, a West Point math professor and director of West Point’s Center for Leadership and Diversity in STEM, had student teams build circuit boards that use sound waves and an ultrasonic sensor to determine the distance of an object. Final products were tested by students moving index card closer and closer to the sensor until a buzzer sounded and LEDs lit up. In addition to learning the basics of electricity and circuits, students also bridged the gap between building circuits and programming them to perform tasks by learning code and editing the code to modify their projects. Students from Crown Point, Keene, Ticonderoga, Westport, Peru Central, Moriah, Willsboro and AuSable Valley Middle High attended the workshop.